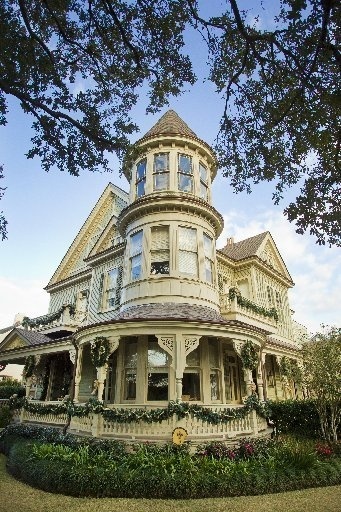 Queen Anne house built in 1895 - St. Charles Ave. @ Audubon Park, New Orleans, LA. The Queen Anne style in Britain refers to either the English Baroque architectural style approximately of the reign of Queen Anne (1702–1714), or a revived form that was popular in the last quarter of the 19th century and the early decades of the 20th century. The historic reference in the name should not be taken too literally, as buildings in the Queen Anne style can bear as little resemblance to English buildings of the 18th century as those of any revival style to the original. Furthermore, the Queen Anne style in other parts of the English-speaking world, particularly in the United States and Australia, is significantly different from that in the United Kingdom. The gabled and domestically scaled, "Queen Anne" style arrived in New York City with the new housing for the New York House and School of Industry Sidney V. Stratton, architect, 1878). Distinctive features of American Queen Anne style (rooted in the English style) may include an asymmetrical facade; dominant front-facing gable, often cantilevered out beyond the plane of the wall below; overhanging eaves; round, square, or polygonal tower(s); shaped and Dutch gables; a porch covering part or all of the front facade, including the primary entrance area; a second-story porch or balconies; pedimented porches; differing wall textures, such as patterned wood shingles shaped into varying designs, including resembling fish scales, terra cotta tiles, relief panels, or wooden shingles over brickwork, etc. ; dentils; classical columns; spindle work; oriel and bay windows; horizontal bands of leaded windows; monumental chimneys; painted balustrades; and wooden or slate roofs. Front gardens often had wooden fences.